Even though dogs do not ‘talk’ in the same way that we do, they do manage to communicate with other dogs’ quite well. Dogs use some forms of vocal communication (whine, bark, growl, howl, etc.) as well as a variety of body postures and movements to indicate their messages. Puppies learn these communication skills while with their litter and mother. Puppies separated from their litter before eight weeks of age run the risk of not having enough exposure to this process and may exhibit behavioral problems. If you spend some time learning canine as a second language, you will be rewarded with a much better understanding of your pet and his behavior. 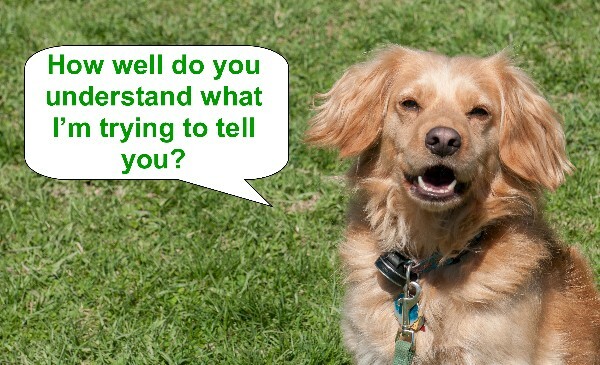 With study and practice, you can learn to understand what your dog is trying to communicate. 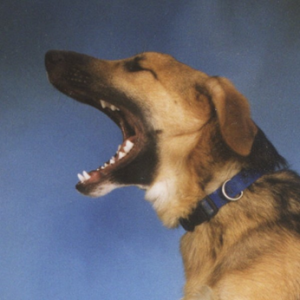 Barking, whining, and growling are all means of vocal communication. Whining is an indication of stress or anxiety. A dog may whine when he is doing something that he dislikes or that frightens him. Punishing a dog for whining will only make the problem worse. You need to determine the cause of the stress and find a way to remove it. Growling can take two different forms. 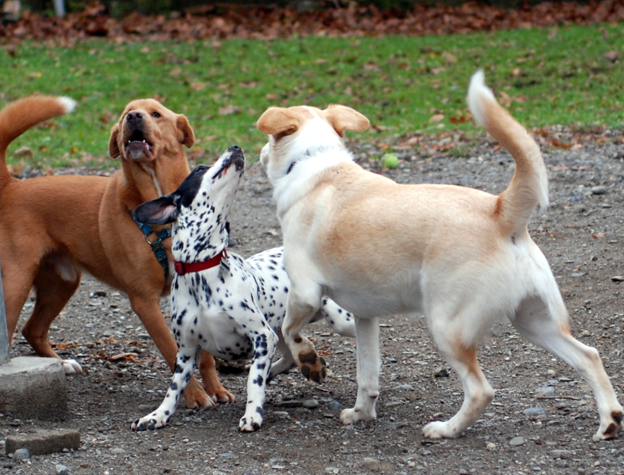 A ‘play’ growl can be heard when dogs are engaged in roughhousing or mock fighting. It is usually low and rumbly, but soft. A warning growl is different. This dog means business. A warning growl usually increases in volume as it continues and is accompanied by a menacing body posture (this will be discussed further below). Never punish your dog for growling. A growl is a very useful warning signal. A dog that is punished for growling will stop the growling, but it will not remove the reason for the growl. A dog that no longer growls no longer gives a warning before taking more drastic action. As a trainer who sometimes deals with aggressive dogs, I much prefer a dog that gives me a warning. Certain breeds of dogs are more prone to barking than are others. A bark can convey many different kinds of information. If you listen closely, you can probably tell an “I’m bored” bark from a “somebody is at the door!” bark. Some dogs are recreational barkers and just love to hear the sound of their own voices. They bark and bark and bark. Since this behavior is self-reinforcing, it can be difficult to resolve. People have gone to extremes to remedy a barking problem, everything from electronic shock collars to having the dog’s vocal cords cut. However, even these extreme methods do not stop many dogs and do not change the dog’s emotional state that is often one of anxiety and fear. While a shock collar or removal of the dog’s vocal cords may make us feel better, it usually makes the dog feel worse. Barking is a very complex behavior. If you have a barking problem, I suggest you work with a qualified trainer or behaviorist. While dogs do vocalize, most of their communication with one another, and even us is done through their body language. Canine body language is very subtle, yet also very sophisticated. Research by Dr. Patricia McConnell has indicated that “Important signals may last only a tenth of a second and be no bigger than a quarter of an inch.” For Example: Leaning forward ½ an inch can stop a dog from coming while leaning back ½ an inch encourages the dog to come. 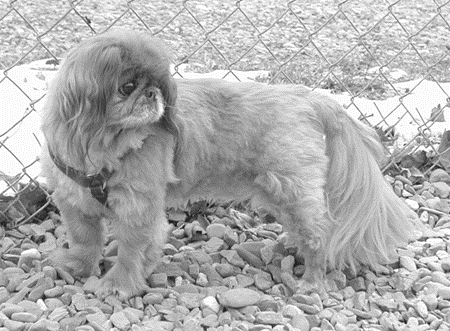 Dogs manage to convey an enormous amount of information by small changes in posture and demeanor. For example, many people believe that a wagging tail signals a happy dog. If the tail is low and relaxed, this is probably true. 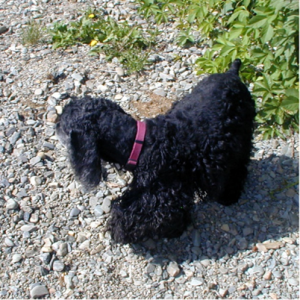 However, if the tail is held high and is quickly switching back and forth, the dog is signaling agitation or the possible intention to attack. In addition to the tail, there are other cues such as whether or not the hackles (hair along the back of the neck) are raised. This little trick actually serves to make the dog look bigger and more frightening, and usually occurs when the dog feels threatened. However, the hackles may simply be up because the dog is in a high state of arousal or excitement. We often see this when dogs are simply playing. Other signs of aggression can include a dog that takes a stance with most of its weight over its front legs, almost leaning forward on its toes. Ears may be back or up, depending upon the breed. Along with a low growl, the dog may snarl and show teeth. A dog that intends to attack will probably stare hard at its victim. 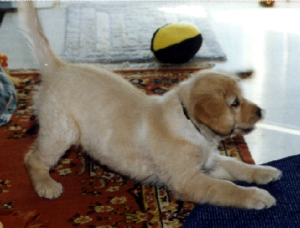 A submissive dog displays a whole different set of postures. The submissive dog will keep its head down, and may lower itself to the ground. 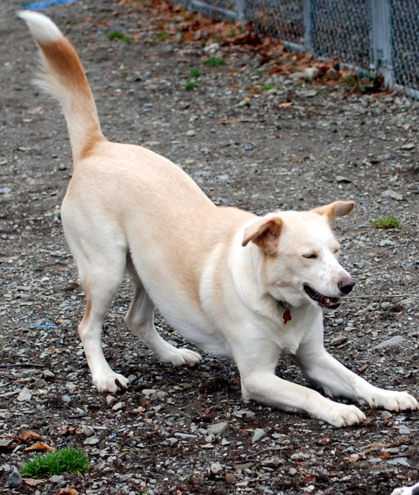 A really submissive dog may go ‘belly up’ or urinate when approached. These are indications that the dog is trying to avoid conflict and does not want to fight. The submissive dog will not usually look directly into your eyes. A dog that has panicked and is very frightened may stare at you. Aside from tail wagging, a happy dog usually displays other signs. Some even go beyond tail wagging to whole body wagging! A happy dog’s mouth is usually slightly open and relaxed. They often look as though they are laughing. The entire body seems at ease when the dog is happy. When two dogs are together, people often have a hard time telling whether the dogs intend to play or fight. One sure sign of intention to play is a play bow. In a play bow, the dog rests its front legs and chest on the ground and leaves its hindquarters in the air which is then often accompanied by frenzied tail wagging and jumping from side to side. A play bow is an invitation to romp. Try getting a play bow from your dog by getting down on the floor and doing one first. Dogs who intend to fight have a much stiffer body posture and their movements are sharper and more deliberate. When you bring your pet to us for boarding or grooming, you let us know your pet’s needs and requirements by talking to us. As humans, our primary method of communicating with one another is the spoken word. More simply, we make noises that other humans can understand. People are so accustomed to communicating with our own species by talking, that we presume it is the most efficient method of communicating with other species such as our dogs. That is not the case. While our dogs offer many vocalizations (barking, whining, howling, etc.) their primary method of communicating with one another and with us is visual. They observe body language. When with one another they look at how they stand, what they do with their tails, ears, eyes, and lips. This is why most dogs will learn a hand signal easier and quicker than they learn a verbal cue for a behavior. To demonstrate this, Dr. Patricia McConnell, a canine behaviorist at the University of Wisconsin, conducted a simple experiment. She selected 24 puppies, six and a half weeks old, four each from litters of Australian Shepherds, Beagles, Border Collies, Dalmatians, Cavalier King Charles Spaniels, and Miniature Schnauzers. She and her graduate students then spent four days training the puppies to “sit” upon presentation of both an audible and a visual signal. The trainer presented a sound at and then they scooped their hand up over the puppy’s head. On the fifth day, the trainers presented the puppies with one signal at a time so they could determine whether the audible or visual signal resulted in more correct responses. Twenty-three of the 24 puppies responded better to the visual signal than the sound. One of the puppies responded equally well to both. Eight of the puppies did not respond to the audible signal at all. The following table indicates correct responses to audible and visual signals by breed. This simple study suggests that when training our dogs we can make it easier for them and ourselves by teaching a visual cue first. We also need to be aware of everything we are doing with our bodies when training our dogs. Just because we think the visual cue for sit is scooping our hands, does NOT mean that is what the dog is really cueing on. For example, one year one of our students commented his dog was inconsistently responding to a visual cue for sit. After watching them for a few exercises, I quickly determined the problem. While the student usually scooped his hand for a sit, occasionally he would scoop his hand and then rest his hand on his stomach. The dog sat every time the student scooped and then rested his hand on his stomach. The dog had a visual cue for SIT; it just was not the cue the student intended. Spend some time watching your dog interact with you and other living things. The better you learn their language, the happier you both can be. When dogs interact with one another and with us, they often use body language to cut-off perceived aggression or other threats. Turid Rugaas, a canine behaviorist from Norway, calls this type of body language “Calming Signals.” These signals are used to prevent aggression, and for calming down nervousness in others. 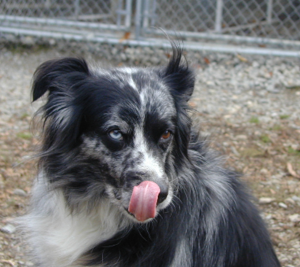 Dogs use these signals to communicate with one another, us, and even other species of animals. They are a dog’s primary method of resolving a potential conflict. By learning, understanding and using these calming signals, you can communicate better with your dog. I have outlined some of these calming signals below. If you would like to learn more about them, I suggest you read Ms. Rugaas’ book, On Talking Terms With Dogs: Calming Signals and watch her video, Calming Signals: What Your Dog Tells You. Breaking eye contact, by averting the eyes is often the first sign of stress observed in a dog. If your dog becomes nervous about the approach of another dog or person, he may turn his head from side-to-side, or may just turn away; which signals the other dog that they are approaching too quickly or too directly. A full body turn is an extension of turning your head. If a group of dogs are playing and some of them get too rough, other dogs may turn their side or back to them to get the dogs settled down. We often saw this behavior with our dogs when playing. If our Border collieX Shed felt play was “getting too wild,” she would turn away from the other dogs. If your dog is jumping or whining at you, turning away from them may help calm them. Rapid flicking of the tongue over the nose is also a common calming signal. It is often seen with dogs at the veterinarians or when the dog is at the groomers. 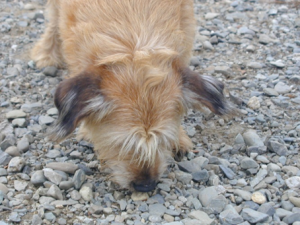 Sniffing as a calming signal must be reviewed within the context in which it appears. 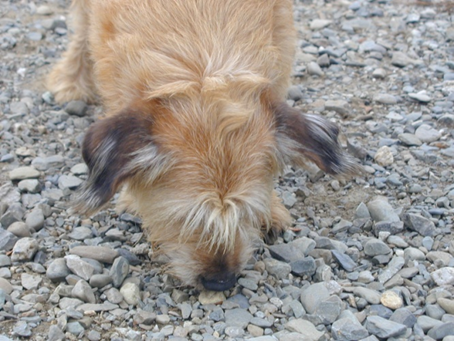 Obviously, dogs sniff for other reasons than to just indicate stress. However, if a dog suddenly starts sniffing in a difficult situation, it is probably a sign of stress. Dogs may yawn when in stressful situations such as at the vet’s office or during a quarrel among its family. If your dog is feeling stressed, standing still and yawning may help them relax. They need to see you yawn though, so even though it is impolite, you do not want to cover your mouth if this is to work. 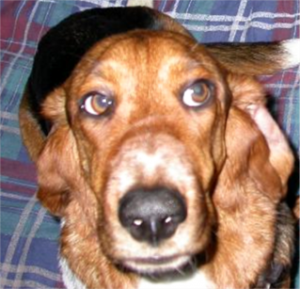 When a dog squints, it is a way of showing that they are comfortable in a situation. As illustrated here this dog is also in a play bow. 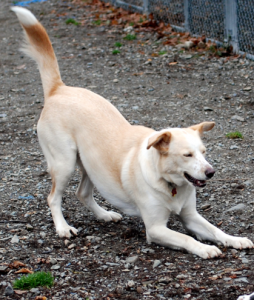 Dogs will use a modified “play bow” (front legs and chest on the ground with hind quarters in the air) to initiate play or to calm another animal down that is causing them some uncertainty. Unlike a play bow as an invitation to play, a play bow used as a calming signal occurs slowly. You can do a play bow to initiate play or to help relax a dog. Scratching is like sniffing; dogs will scratch for many reasons, and it does not always mean they are feeling stressed or anxious. However, a dog that is under stress will often scratch while under stress. Splitting occurs when the “splitting” dog places themselves between two or more dogs in the early stages of an altercation, in an attempt to diffuse the situation. This behavior sometimes occurs when two humans are hugging. Why Do We Need to Know All of This? 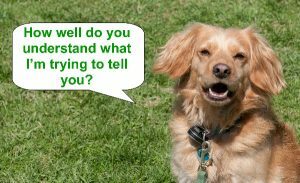 Dogs communicate very well with their bodies, and if we know what they are trying to tell us we can often help them get out of a stressful situation. The graphic below is the Stress Escalation Ladder developed by Turid Rugaas. 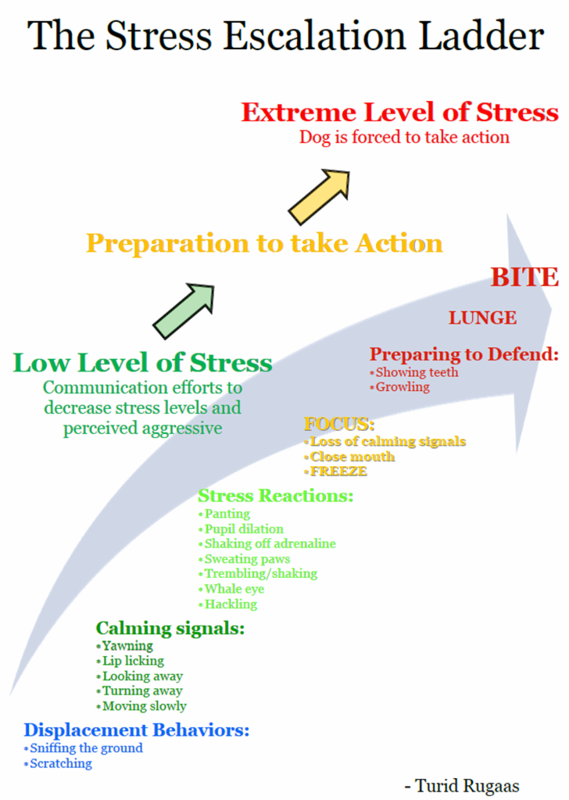 It illustrates how stress increases and what signs we see in our dogs as the stress elevates. The earlier we can intervene the less likely our dog is to get out of control. Do not bend over your dog. Squat next to them or stand straight. When you bend over the dog, you are putting them in a defensive position. When training the recall, stand straight or squat with your arms outstretched. Stooping over the dog will cause him to avoid you. Your face says a great deal about your attitude. When petting a dog for the first time, touch them on the sides of their body and their chest. Never pat them on the top of the head. Avoid hugging your dog. No matter how much pleasure you get from hugs, your dog does not enjoy it.